We are just wild about Booklist’s starred review of Too Wilde to Wed here at Team Eloisa! This sentence is so fabulous we couldn’t even trim it down. “James again elevates historical romance to sublime new heights through the lithe elegance of her writing, her exceptional gift for creating richly nuanced characters, and her ability to flawlessly marry potent sensuality with a deliciously dry sense of humor.” Have you preordered this “sublime” novel yet and registered your preorder so you receive the next installment of Wilde Denial? Are you on Instagram? Eloisa’s having a blast sharing some of her favorite books, reader art, fun with her author friends and loads of giveaways! You can follow her at @eloisajamesbooks. The next edition of Eloisa’s Five Fabulous Things will be going out in a couple days. Make sure you open it! We’re sharing a tidbit from Too Wilde to Wed and Eloisa’s giving away five coin purses she picked up in Italy to share with readers! You can buy this “richly woven regency story” for only $4.95 for two more days. The sale ends on February 25. You do have to be a member of Audible to purchase, but you can try them for free for 30 days! 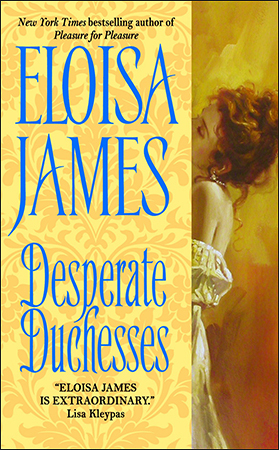 If you’d like to sample Desperate Duchesses, here is a short audio excerpt on Eloisa’s website. How about giving yourself a Valentine’s Day present? Midsummer Delights costs less than a box of chocolate, and it has three short delightful stories that will leave your heart dancing with delight. Worried you’ve read them already? All three stories have only been available in limited release until now. Do you remember the rascals who labeled Josie Essex a Scottish Sausage? Josie and the Earl of Mayne make an appearance in A Midsummer Night’s Delight, supporting Miss Cecilia Bellingsworth when she transforms, a la Cinderella, and dazzles a room full of gentlemen. This novella was included in the (digital only) Essex Sisters Companion Guide. In At Midnight, Eloisa gives us another twist on Cinderella! Miss Penelope White takes fate and love into her own hands and filches one shoe from her true love, Elias Hempleworth-Gray. This fun, sweet story was included in the (print only) Fairy Tale sampler. Violet Leighton and Rothwell Talcott had a perfect love affair—until Rothwell left for a year, and that year turned to four. Violet was left broken-hearted and with her virtue in tatters. Now that he’s back home—and a duke—will Violet ever be able to forgive him? Ever After has been available only in the print edition of The Ugly Duchess until now! Being (most inconveniently) a virgin who had never even been kissed, Cecilia was uncertain about her ability to seduce a gentleman. Dear Readers, please meet Cecilia from the short story, A Midsummer Night’s Disgrace. Newly posted is the excerpt from Midsummer Delights, a delightful treasure of three stories with a Cinderella twist. Readers need only wait until February 6 for the ebook. Pre-ordering is available! While you wait for both Midsummer Delights and Too Wilde to Wed (May 29), why not explore Eloisa’s audio excerpts! Over 20 audio snippets are posted here on EloisaJames.com. Small delicious samples… Enjoy!